SUZHOU, China — Canada has swept the championship draws at the inaugural World Cup of Curling. Kevin Koe's Calgary foursome defeated Steffen Walstad of Norway 6-5 in the late match on Sunday for the men's crown. 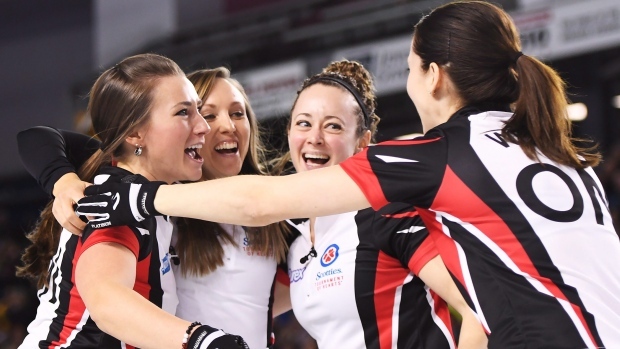 Earlier Sunday, Rachel Homan's Ottawa rink beat reigning Olympic champ Anna Hasselborg of Sweden 7-3 to win the women's title. Meanwhile, Edmonton-based Laura Walker and Kirk Muyres downed Sarah Anderson and Korey Dropkin of the United States in the mixed doubles final by an identical score. Koe's newly formed men's team — which includes third B.J. Neufeld, second Colton Flasch and lead Ben Hebert — went ahead in the second when Walstad made an error that cost his side three points and gave Canada an early lead. "The second was a big end and after that we managed to keep control," Koe said. "We weren't really in trouble in any end. He had an unfortunate one there on his last, I think it picked. We got a break there, we capitalized and we played solid." Norway cut the lead to 3-2 in the third when Koe was too heavy with his last stone and missed a chance at a steal, allowing Walstad to take an easy tap back. But another mistake by Norway, as Hoeiberg crashed his own guard, let Canada stretch its advantage to 5-2 by claiming two points in the fourth end. Walstad's end picked up two points in the fifth, but it couldn't take advantage with the hammer in the seventh. Walstad conceeded that Canada earned the victory. "They're a better team," he said. "We were struggling even in the beginning. My last one in the second was not even close. They are playing a lot better and deserved to win this one, we'll have to come back a lot stronger next time. Koe said he was pleased with his squad's performance in spite of their unfamiliarity with each other. "We're really happy," he said. "This is the first event of the year and we hadn't played together before properly. There's some really good teams here, we didn't know what to expect. In women's action, Homan, alongside Joanne Courtney, Emma Miskew and Lisa Weagle, scored two in the second end and extended her lead to 3-0 in the third before Hasselborg got on the board with a single in the fourth. Hasselborg cut it to a 4-3 Canada lead heading into the eighth and final frame, but Homan scored three to secure the victory on the first leg of this new four-leg Curling World Cup series. "It's really exciting," said Homan." "This is the first event of the year and I'm really proud of my teammates. It was a grind. Both teams played so well. Anna's team was phenomenal right to the end. That was a tough shot at the end, it was a great line call and great sweeping, so I'm just really proud of my team." Earlier, Walker and Muyres fell behind early but didn't let it get to them. The U.S. was ahead 3-1 through three rounds, but Canada scored at least a single in each of the final four ends — including three in the fifth — to come from behind for a 7-3 victory. The World Cup features four tournaments of team and mixed doubles competition involving the top curling countries in the world. Each country determines its representatives for each leg. Canada's victories on Sunday guarantee it one team in each discipline at the grand final. The World Cup offers a total of US$775,000 for a prize pot. Winning one event is worth up to US$33,000 to a team and that number doubles in Beijing.